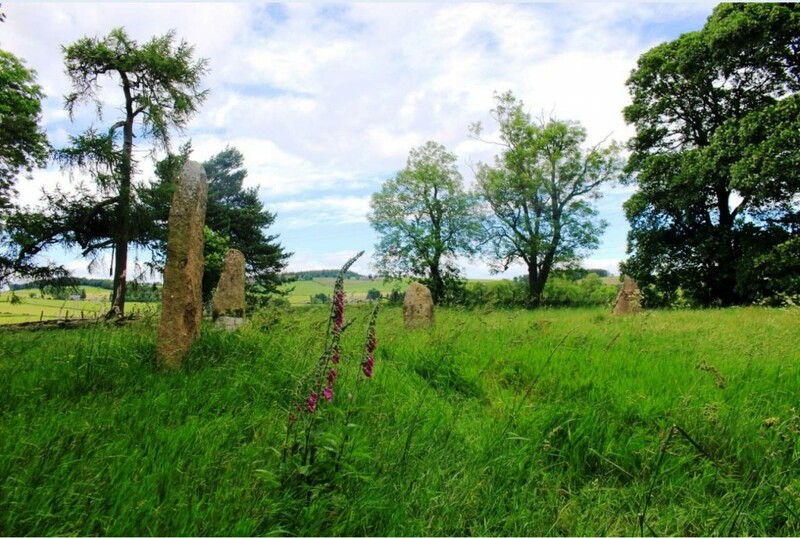 During a visit to Aberdeenshire in June 2017 to observe as many recumbent stone circles as our eleven days in Scotland would allow, I visited Sunhoney recumbent stone circle on two occasions. 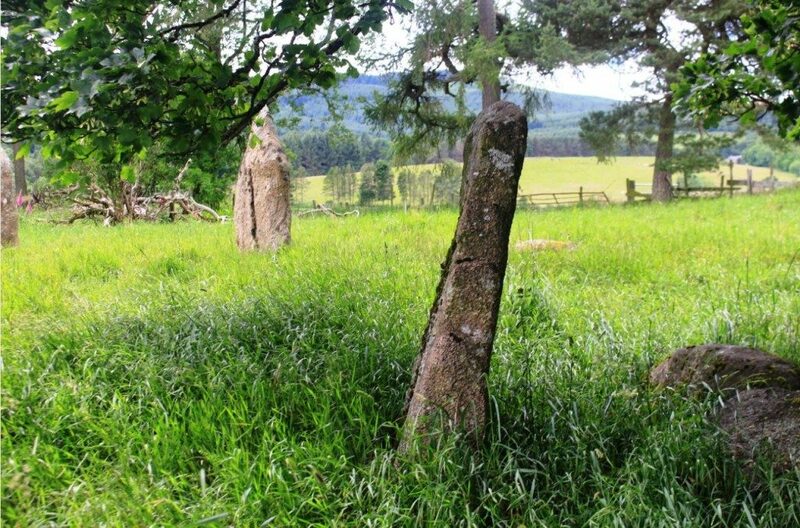 Located on the coastal plain near the foothills of the Grampians, its exact location near the village of Echt is described here on The Megalithic Portal. 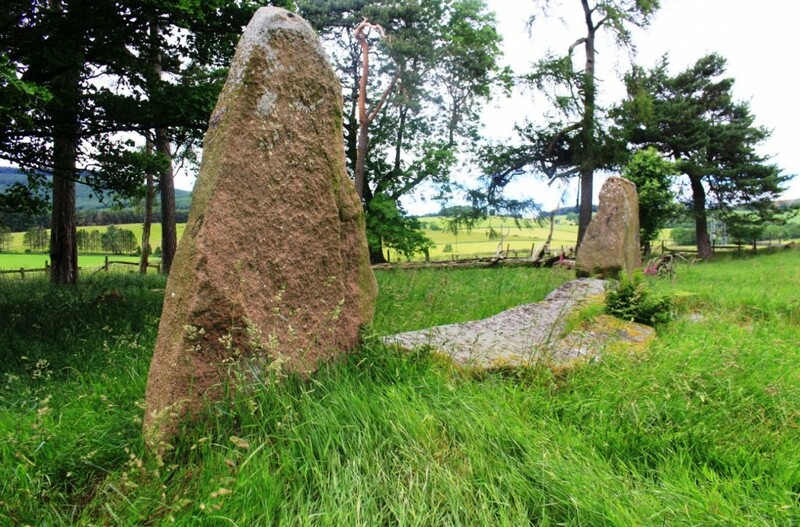 The first occasion was the afternoon of Sunday 18 June 2017, after visiting Midmar Kirk recumbent stone circle less than two kilometres to the west. Driving along the B9119, the first indication of arrival at the location is the sign below. 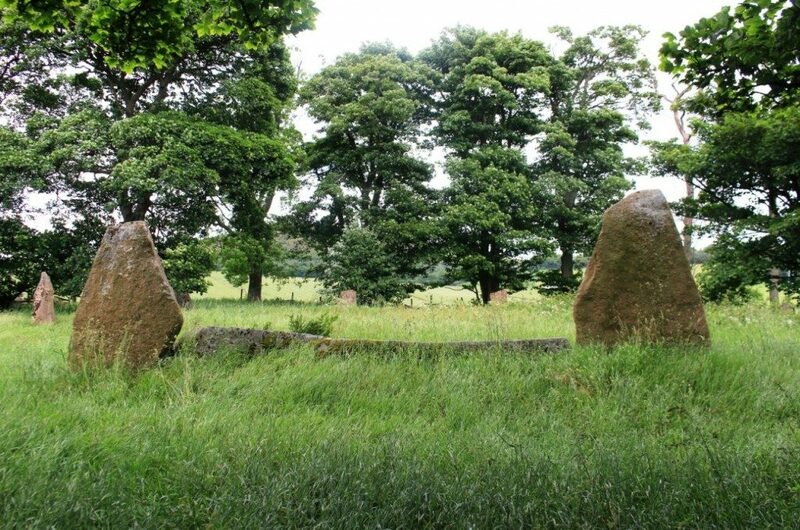 Sunhoney recumbent stone circle stands on private land, forming part of a working farm, and is not managed by Historic Scotland. 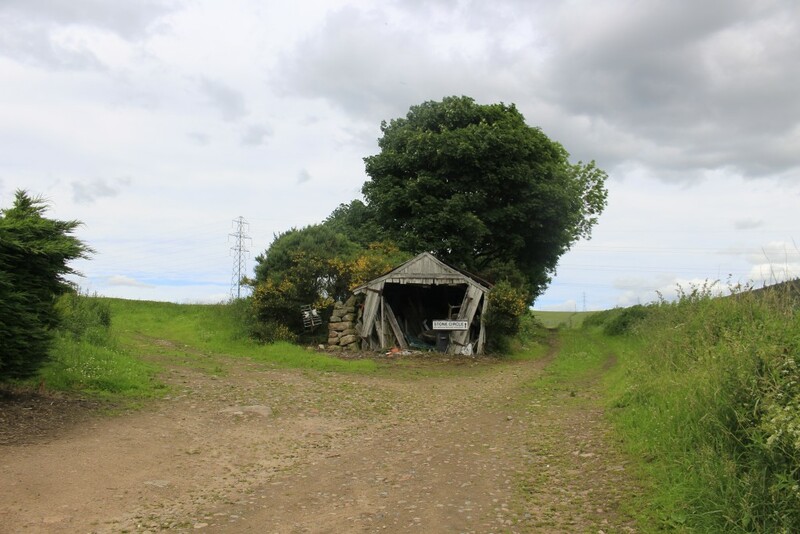 On arrival, Terence Meaden, who I was travelling with, sought permission from the farmer for us to visit the site. The owners were friendly, kindly acceded to our request, allowed us to park in their farmyard, and did not charge an entry fee. 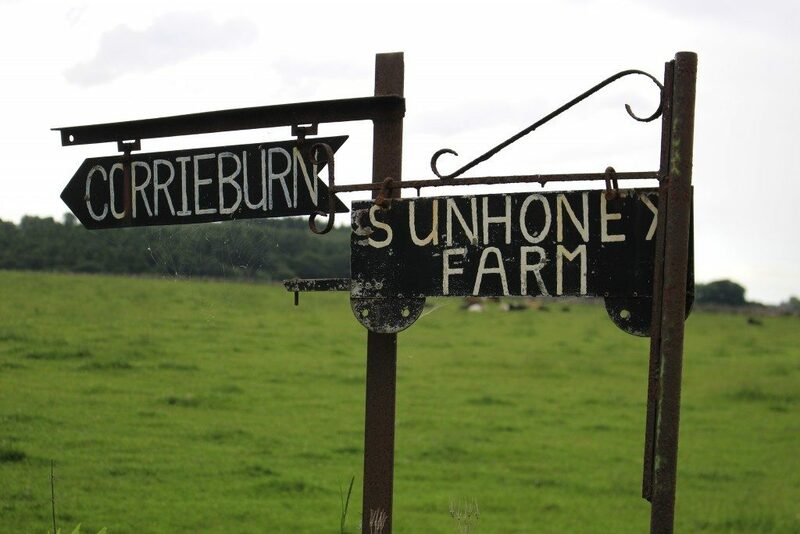 Below: After parking, the initial pathway to Sunhoney is signposted to the right here. 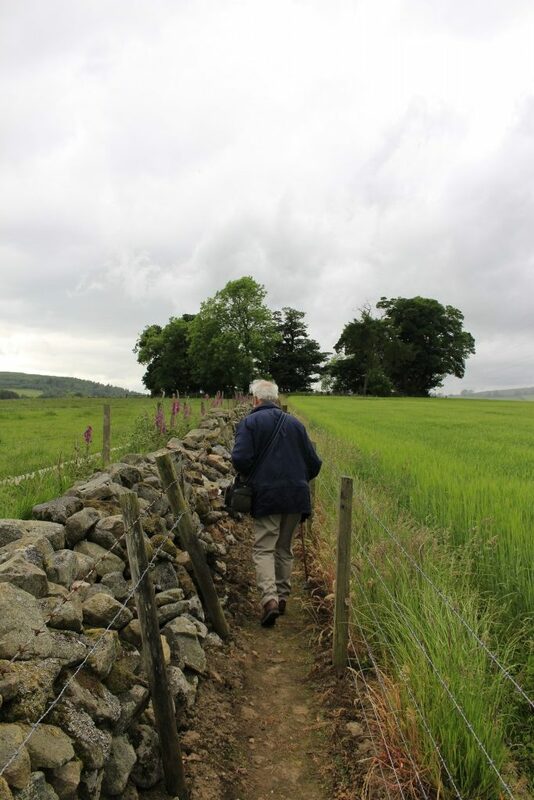 Below: Terence Meaden on the final pathway to the stone circle, inside the distant copse of trees here northwest of the farmhouse. 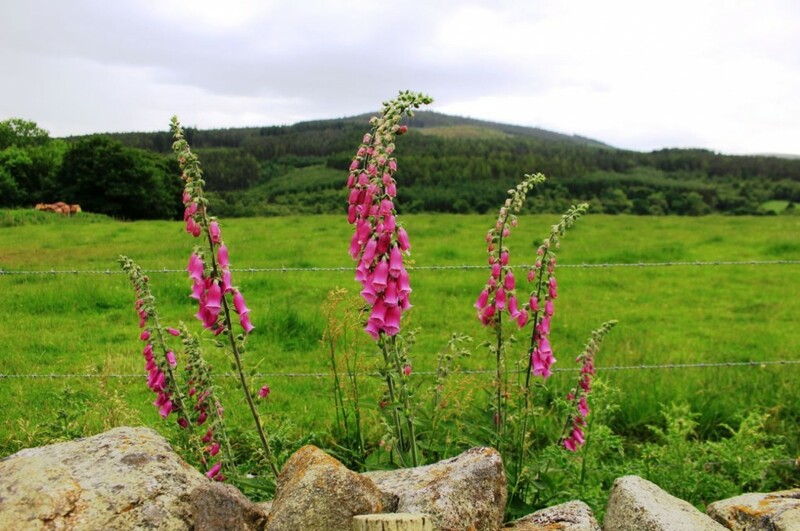 Foxglove flowers digitalis pupurea were in bloom on the left behind the stone wall of the pathway. 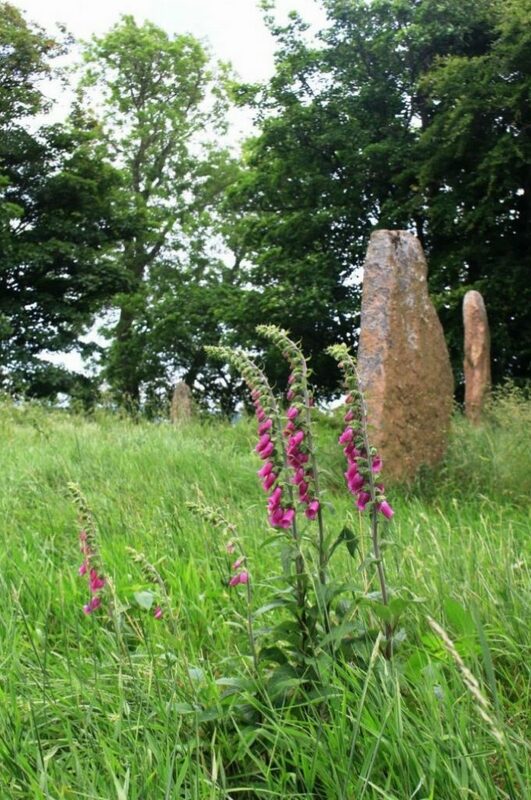 – The foxglove bells, with lolling tongue by Mary Webb here. 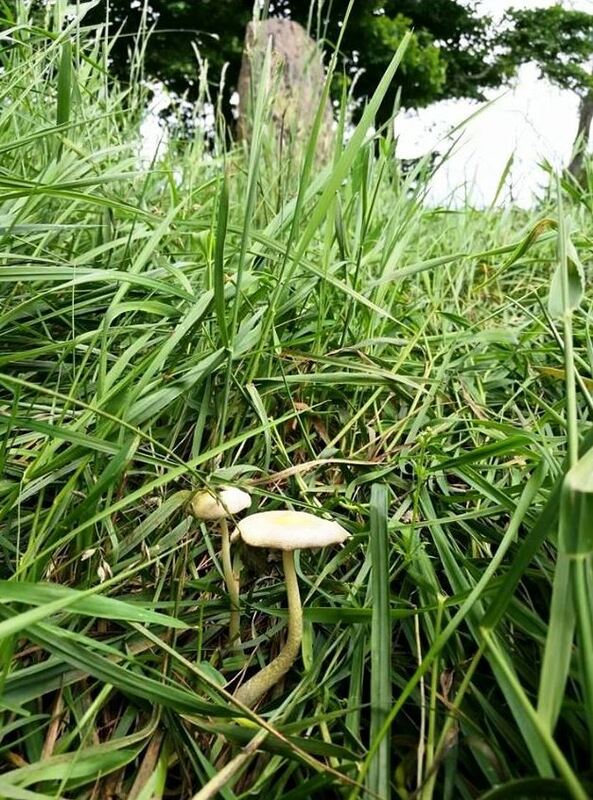 Below: The first photograph taken on arrival, by which time it had started to drizzle, which falling on the luxuriant grass and gently dripping from the leaves of the trees somehow created an overriding impression of Mother Nature’s fertile abundance. Below: Sheltering the camera under a tree, waiting for the drizzle to pass over. 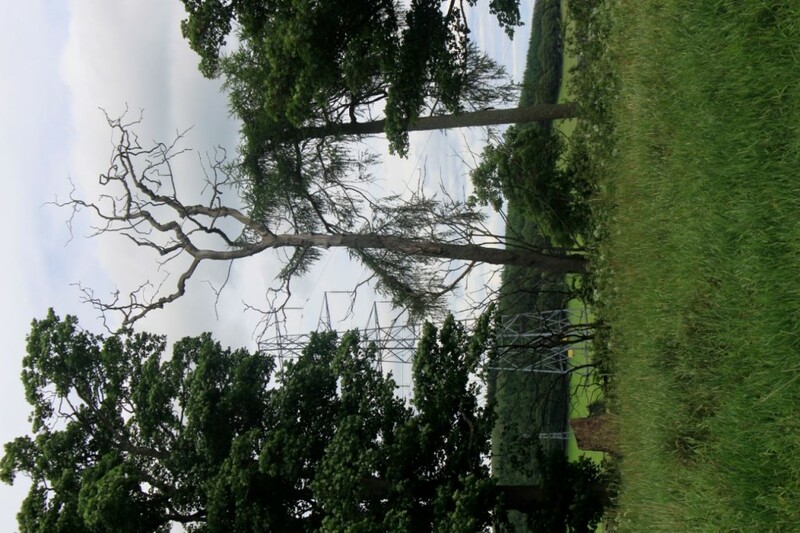 During this first visit, Terence Meaden concluded his initial research promptly and, due to the rain, we did not spend a great deal of time on site. I was drawn back to visit Sunhoney on a second occasion on Friday 23 June 2017, at which time the weather was dry. 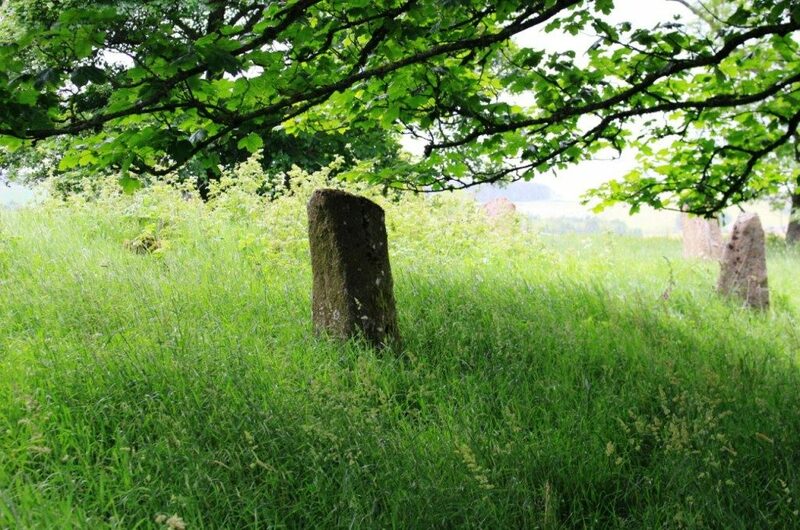 Below: The fallen recumbent stone and its flanking stones. 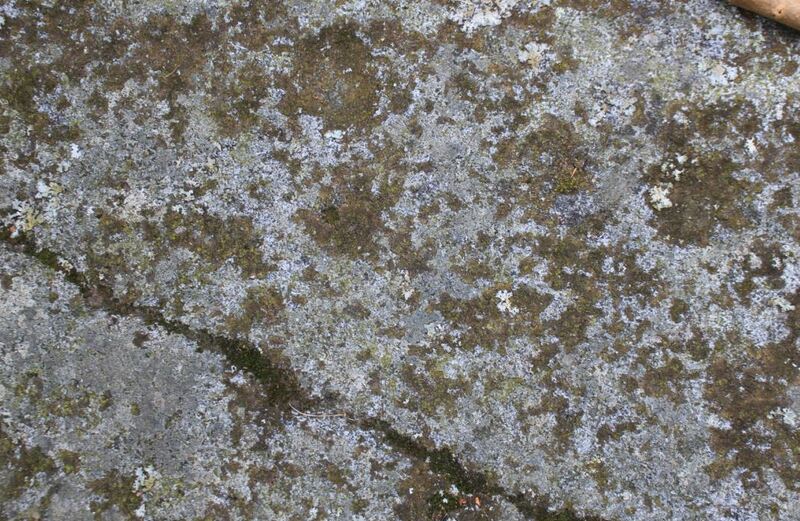 Below: On these two visits, lighting was flat and the cups marks visible on the recumbent stone did not photograph well. ‘On what is at present the upper surface of the recumbent stone, are 31 cup marks, but as this stone appears to have fallen over on its inner side, it seems probable the marks were originally on the outer or southern face. There is also a similar cup on a fragment split off from the recumbent stones when it fell.’ – F. R. Coles, 1900; J. Ritchie, 1918. 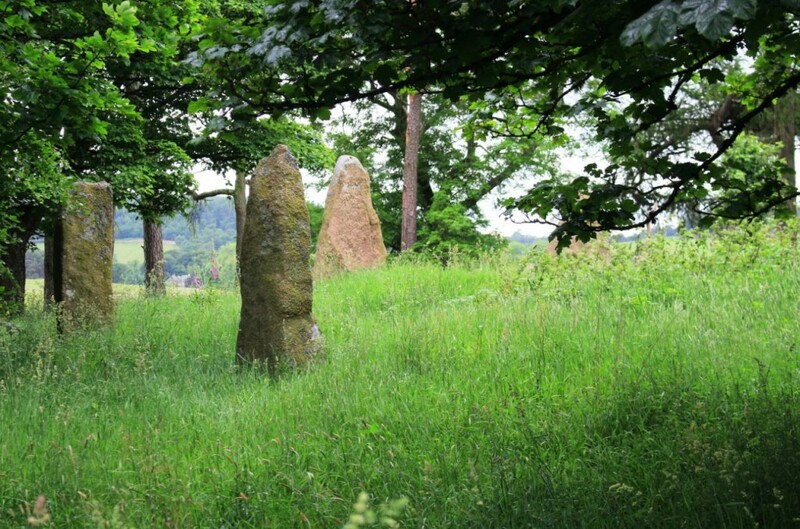 The online catalogue to Scotland’s archaeology lists its record for Sunhoney here. Aberdeenshire council’s record for the site, which includes details of the last excavation in 1865, is here. 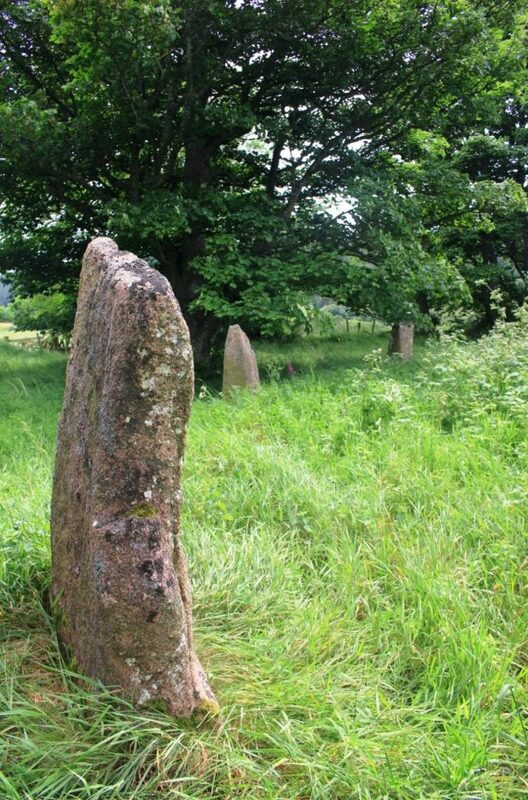 Below: The recumbent stone and its flanking stones photographed from outside the circle. 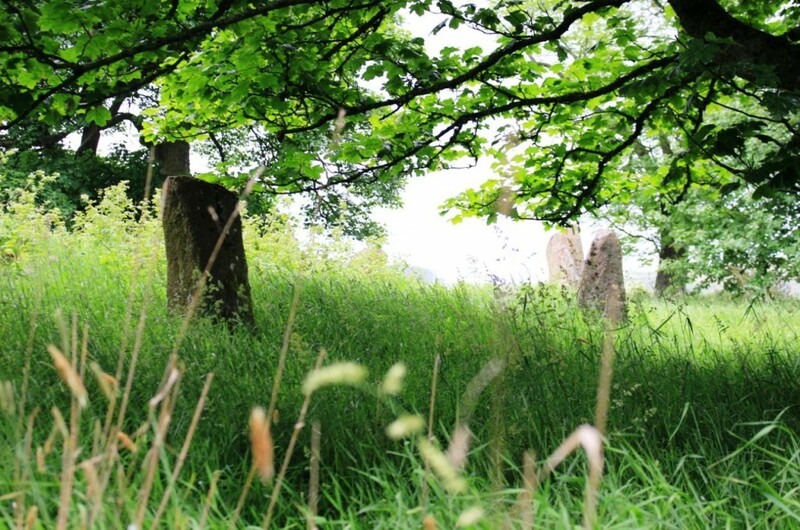 Below: The old, the dead, and the new. Additional descriptions of visits to the site are here on The Modern Antiquarian. 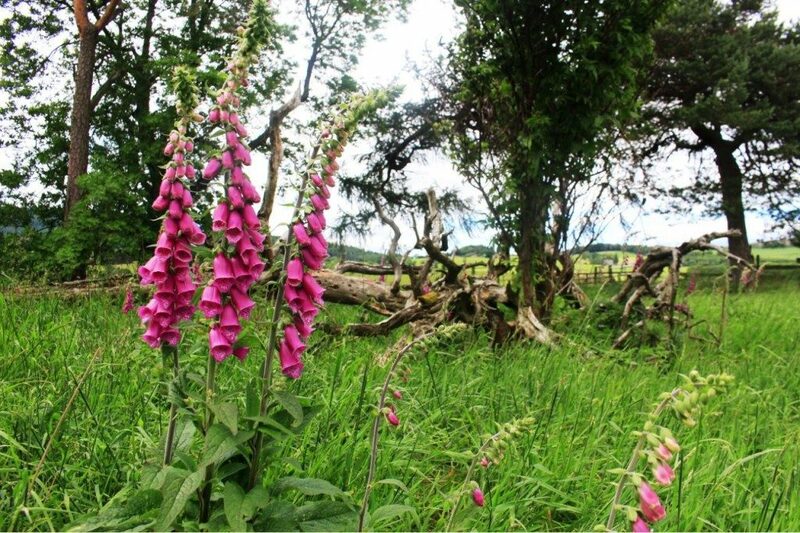 The appearance of foxgloves belie their deadly quality. 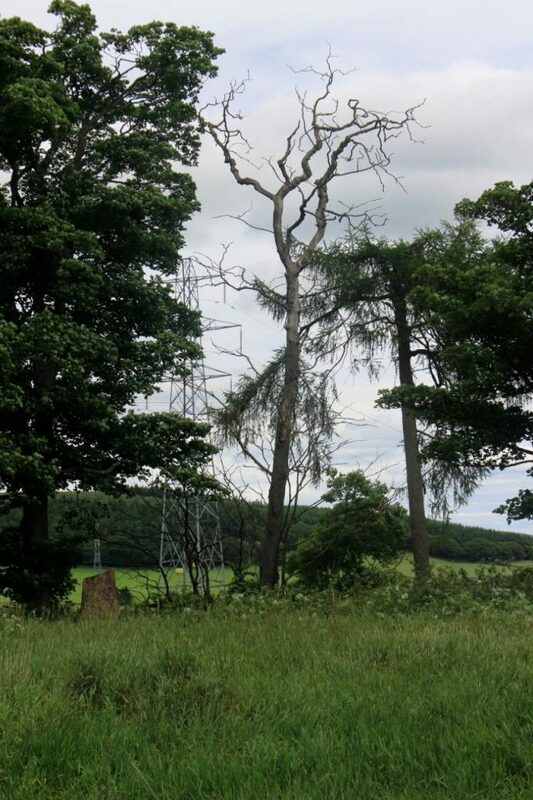 An old saying suggests, ‘It can raise the dead and it can kill the living’, more here. There is something about Sunhoney, something impossible to frame into the blunt instrument of words, which is special, truly special.